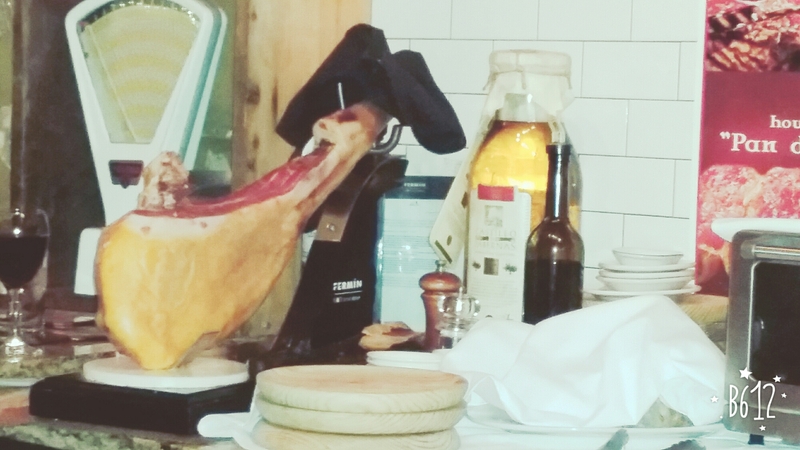 There is something about seeing Serrano ham, jamón serrano, on a hook next to a glass of wine that keeps me engaged. It’s the visual cue that evokes the memories of Madrid and Barcelona. A good restaurant serves good food. A great restaurant gives you the full sensual experience of eating, seeing and listening. Sala One Nine on West 19th Street in NY did that for me. The restaurant was buzzing with young professionals, each better looking than the last. My friend and I sat on the bar stools, surveyed and feasted our eyes. The music was loud but the conversations around us were even louder. Loved the energy the place had. The service was so so. The servers were too busy to ensure that we had food and drinks. Minus one to Sala One Nine from an almost perfect score. This is on the bar counter where I sat. As soon as I saw it, I was back on the streets of Madrid passing by many ham stores, having a big fight with my daughter’s father. Sometimes, life gives you so many cues to switch your path but you must be open and self-aware enough to see them. I was blind then. Having a young child and a promise of forever can take away one’s center and a sense of self. 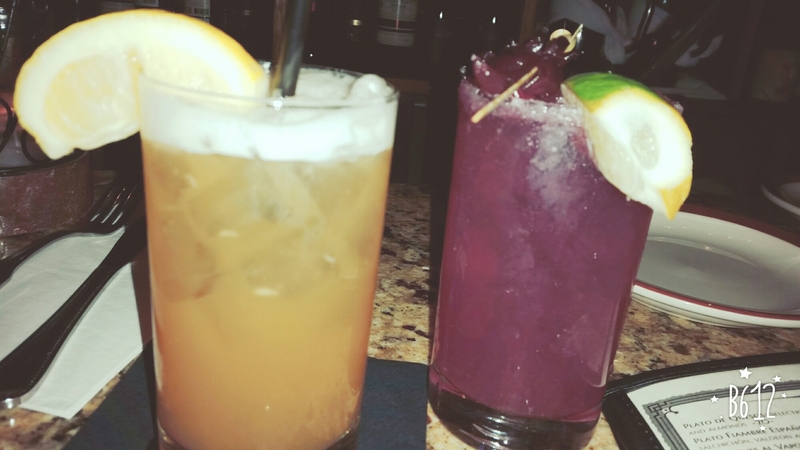 Spanish cocktails. It’s too bad that I did not document the cocktail menu while I was there. My pomegranate drink was excellent – a nice wind down from a rough day. We celebrated my friend getting into the medical school with these! 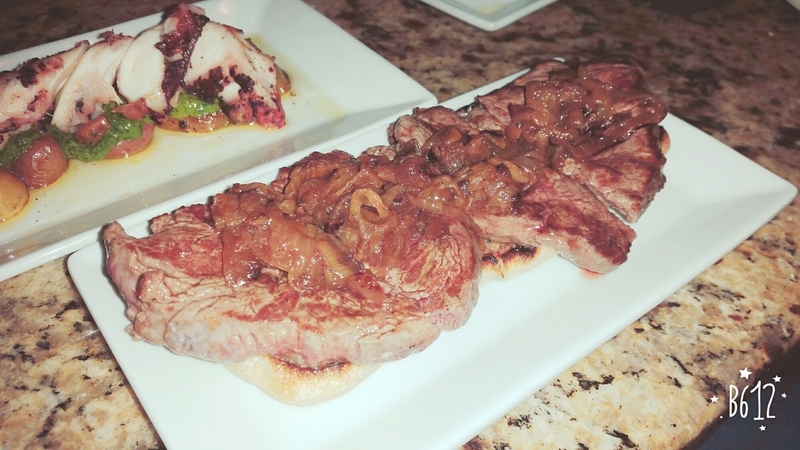 Chuleton A La Brasa grilled 16 oz. “vintage farm” rib-eye, roasted garlic butter and fries. Pulpo A La Gallega: octopus, potato, sea salt, extra virgin olive oil and paprika. I am an Octopus whore and will pass on Serrano ham for grilled octopus. I did not regret it. 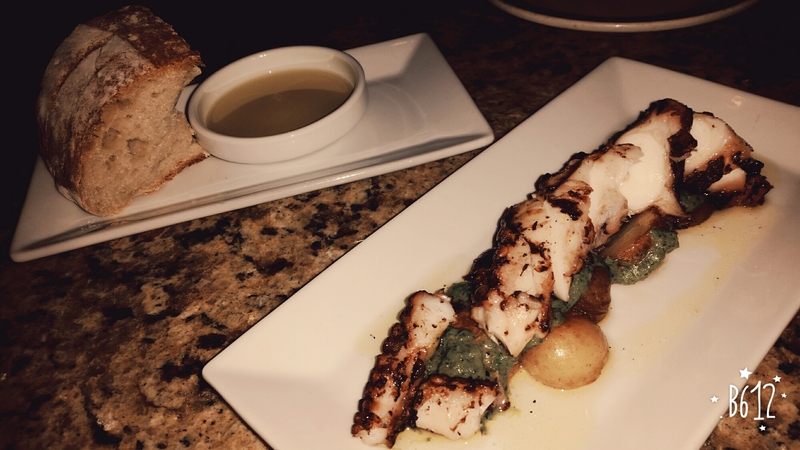 The simple preparation is always the best for the octopus. This was yummy. Will need to return for the ham and the beef tripe. I loved the experience at Sala One Nine. I loved the octopus and the cocktail. I love the cues I get and the trek I am on. The blinders are still on but I take them off once in a while to machete the overgrown vegetation in this hot mess of a jungle.